Scroll down on this page for Historical Snowfall and Snowdepth Info including numerous charts and graphics. One of the most outstanding characteristics of the Cascade Range is its prodigious snowfall. The maritime climate of the Pacific Northwest coupled with the large vertical relief of the mountains and volcanoes produces frequent snowstorms and deep snowfalls. Orographic (mountain-induced) lifting combined with strong westerly flow aloft delivers the goods, often in stunning amounts with storm totals occasionally exceeding 5 ft (1.5 m) in two days or 10 ft (3 m) in a week. The annual averages of nearly 700 inches (17 m) at some Cascade locations are the largest recorded at any measuring stations in the world (although locations in the Saint Elias Mountains of southeast Alaska are believed to have even greater snowfalls). A list with several impressive Cascades snowfall records can be found below. For spring and summer skiing, the depth of the snowpack is more important than the quantity of snowfall received during the season. Thankfully, the dense, high-water-content snow which is typical of the Cascades builds a much deeper and more stable base than comparable amounts of drier interior snow, and the avalanche hazard is much more predictable and avoidable in the Cascades than in the Rockies. The snowpack of the Cascades typically builds to a maximum depth near timberline of about 10-15 ft (3-4.5 m) by April each year, but it can approach 30 ft (9 m) in exceptional snow years. Even though the quality of Cascade snow is maligned by some who derisively refer to it as "Cascade concrete", light and dry powder can usually be found when the storm track comes from the west and northwest. The flakes can just keep falling and falling in these conditions, rapidly building to chest-deep amounts such as the 50-60 inches (120-150 cm) of cold smoke which fell on March 6-7, 2003, from Crystal Mountain and Mount Rainier all the way south to Mount Hood, providing the best powder day I've ever had! This page contains various Cascade snowfall and snowdepth data which I have collected and analyzed over the past several years. Good records are much easier to obtain for snowdepth than for snowfall especially in remote locations, since the depth need only be recorded on an occasional basis instead of the daily (or even more frequent) recording needed for accurate snowfall totals. Thus most of the data presented here throughout the length of the Cascade Range is for snowdepth, with snowfall data available for only a few select locations. Hopefully these figures and plots will be both interesting and informative for others, and there are some surprising revelations to be found in the historical data (see below). A list of the data sources can be found at the bottom of this page. Safety first! Before heading out to ski or snowboard any of these areas in winter or early spring, it is best to check the latest avalanche forecast along with recent weather reports. (And obviously, completing a comprehensive avalanche training course is a prerequisite before attempting any winter backcountry trips.) These avalanche forecasts for the Cascades and adjacent regions are generally updated daily from November to April, with occasional updates during the spring if conditions warrant. The "Current Snowfall and Snowdepth Info" below includes links to automated snow and weather telemetry throughout the region. Visit Avalanche.org and CSAC.org for much useful avalanche info. See my Web Links page for additional resources. 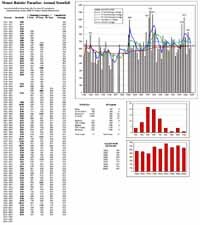 Skimountaineer.com has tracked the snowdepth data recorded at numerous sites along the entire length of the Cascade Range since the 2002-2003 season, on a monthly and now semimonthly basis. This data is painstakingly compiled from numerous separate sources, both government and private-sector, including snow surveys, avalanche forecast offices, and ski areas. This is the only comprehensive summary available anywhere of snowpack conditions throughout the Cascade Range in BC, WA, OR, and CA. It includes primarily sites which are on or near the Cascade volcanoes, along with a few other interesting sites in the North Cascades of WA. Over 45 sites are now tracked in the semimonthly reports below, but numerous other low-elevation and low-snowdepth sites which are of limited interest to skiers have been omitted due to time and space limitations. See Information about Cascade Snowdepth Measurement Sites for more details about these sites including normal snowdepths throughout the season. An archive of the semimonthly snowdepth stats and commentaries during the current season can be found in the 2005-2006 Snow Season Report. The 2005-2006 season got off to a great start with cold temperatures and heavy snowfall from late October into mid-November, building a snowpack well above normal and helping to erase memories of last year's misery. Most ski areas in southwestern BC, the WA Cascades, and Mount Hood opened in early November, their earliest openings since 1994 and for some areas their earliest ever. By November 15, snowdepths were 2-6 ft at many mountain locations in BC, WA, and OR, about 200-300% or more of normal. High pressure brought largely clear skies for the next ten days, settling and shrinking the snowpack, but then another cycle of very cold storms brought several more feet of snow through December 4, maintaining snowdepths well above normal even at lower elevations. Another strong high pressure system then brought two more weeks of sunshine, further settling the snowpack and diminishing snowdepths to below normal in BC, WA, northern CA by December 15, while Oregon remained somewhat above normal. When precipitation finally returned on Dec 18, it was warm, too warm and too wet. Heavy rainfall battered the Northwest through Christmas Day, sending the snowpack throughout the Cascade Range plummeting down the drain towards 50% of normal or less. The situation looked bleak, almost hopeless. Unexpectedly, on Dec 26 the weather pattern shifted to a cool and wet westerly flow, with the jet stream aimed squarely at the Pacific NW and carrying an unrelenting series of powerful storms. This excellent situation would remain in place with only a few minor interruptions for the next 6 weeks. The final week of 2005 brought 3-5 ft of new snow throughout the mountains of the Pacific NW, with another 2-4 ft during the first days of 2006. A brief warmup brought heavy rain on Jan 6-7, but cool weather quickly returned and an intense storm cycle dumped 4-9 ft of snow over the next week, capped by 111" in 7 days at Mt Baker. The subsequent storms were less sustained, but still dropped 2-5 ft atop the rapidly deepening snowpack during the third week of January. A brief high-pressure window brought 2 days of sun on Jan 24-25, but then the storms returned with renewed vigor, burying the mountains under 6-12 ft of additional snow over the next 11 days. By February 1, snowdepths had built to 9-15 ft (roughly 130-180% of normal) at most measurement sites in the Cascades, topped by well over 200" at Chinook Pass. At least one site has set a new record for February 1 snowdepth, Fourmile Lake near Mount McLoughlin with 105", over 200% of normal. During January 2006, Whistler set a new record for snowfall in any calendar month with 185", while the 269" at Mount Baker Ski Area was their 2nd-most ever for a month behind Feb 1999. The 239" at Mount Rainier Paradise and the 173" at Snoqualmie Pass were their most in any January since 1972 and 1971 respectively. The intense storm cycle and heavy snowfall continued into February, with 2-5 more ft of snow falling throughout the Cascades before strong high pressure returned on February 5. The West Coast basked in sunshine for the nest week while the jet stream aimed due north into south-central Alaska, dropping over 11 ft of snowfall in only 7 days at sites such as Alyeska Ski Resort. A weak system finally brought a few inches of snow to the Cascades on Feb 13-15, with isolated amounts of nearly 10" at Snoqualmie Pass and Mount Hood. Overall during the first half of the month, snowdepths have generally decreased 5-20" at most sites in the Cascades, but as of February 15 the snowpack remains at 100-150% of normal throughout the range, except on Lassen Peak where the snowpack is well below normal especially at mid-elevations. As the second half of February began, high pressure and a strong northerly flow around an Omega block delivered an Arctic blast to much of the WA and OR Cascades, with temps dropping as low as -10 °F at many mountain sites, the coldest in about 10 years. Meanwhile, the southern half of the Omega block (a cutoff low off the CA coast) brought 1-2 ft of champagne powder (3-5% density) to the CA Cascades and Sierra Nevada. An overall moist weather pattern returned in late February, starting with a strong frontal system that dropped 2-3 ft of snow on the WA Cascades and 1 ft on Mount Hood on Feb 23-24, followed by a quick system which brought 1-2 ft to the BC Cascades and Mount Baker on Feb 26-27. A powerful system closing out the month aimed southward at CA, dumping 2-3 ft of snow on the southern OR and CA Cascades and Sierra Nevada. Another pair of storm systems ushering in March are likely to dump 2-4 ft more of snow on that region. As of March 1, the snowpack is roughly 100-150% normal throughout the length of the Cascades, except for a few scattered sites which are somewhat below normal. Snowdepths at mid-elevations near treeline are generally 10-15 ft throughout the range, topped by Chinook Pass which is reporting over 200". This is in sharp contrast to last year, when a series of very warm and wet Pineapple Expresses interspersed with lengthy periods of dryness had devastated the snowpack in BC, WA, and OR. By March 1, 2005, the snowpack at most sites in southwest BC, WA, and northern OR had shrunk to record lows, only 0-30% of normal with barely a few feet of snow and extensive patches of bare ground on sunny aspects. Southern OR was slightly better off at 40-50% of normal, while only northern CA remained near normal or slightly above (see 2004-2005 season report). What a relief this year is, it's great to finally enjoy a season which is above-average throughout the entire Cascade Range. Summary of March snowfall and April 1 snowdepths to be written soon . . . Some of the numbers in the table below are preliminary and may be revised over the next few days. This table shows mainly sites which are on or near the Cascade volcanoes. More sites may be added to the list if I find any useful ones. The frequency of data collection varies at these sites, from hourly automated telemetry to manual daily or monthly measurements. Note that multiple sites or data sources are found at several of these locations, and their data values typically differ slightly from each other. The codes used below for Data Frequency read as follows: H = Hourly Snowdepth Telemetry, H* = Hourly Snow-Water Telemetry (snowdepth estimated), D = Daily Manual Snowdepth, M = Monthly Manual Snowdepth (Jan 1–June 1 or less), A = April 1 Manual Snowdepth Only. H, M 01 Apr 2006 103"
NOTE: Current data for Lassen Peak Lake Helen is from the automated snowdepth gauge, which is in a wind-affected location and probably measures about 30" less than the manual snow course. The table below lists numerous record and near-record Cascade snowfall and snowdepth totals, with a * marking those which are probable world records (some records held by locations beyond the Cascade Range are included in gray for comparison). Compiling an accurate list of snowfall records is difficult, since the "official" weather records often ignore or exclude numerous well-documented values. In particular, the official 24-hour snowfall records are only 76" for the US (Silver Lake, CO, Apr 14-15, 1921) and 52" for WA (Winthrop, Jan 21, 1935, and Stampede Pass, Jan 22, 1954), both of which are exceeded by the credible values listed below. The most well-known Cascade snow record is certainly the 1140" snowfall at Mount Baker Ski Area during the 1998-99 season, which is a world record for seasonal snowfall at any measurement site (see this plot of snowfall and snowdepth during that season). The table below lists measurement sites which have the highest average annual snowfalls in North America (locations beyond the Cascade Range are shown in gray). Only sites which have official weather records from the US National Climatic Data Center or Environment Canada National Climate Archive with at least 20 years of data are included here, and averages are taken over the listed period of record. Thus many ski areas which are not official weather sites have been omitted from this list, and it is also possible that some official weather sites which should be included have been inadvertently omitted. Important Browser Note: If you are using Internet Explorer on Windows, you should turn off "Automatic Image Resizing". Otherwise, all of the full-size GIF images linked from this page will appear blurry and unreadable (they should look crisp and sharp). To do this, go to the "Tools" menu, select "Internet Options", then "Advanced", scroll down to "Multimedia", and uncheck the box beside "Enable Automatic Image Resizing". The El Niño / La Niña (ENSO) cycle is certainly one of the dominant factors affecting the quantity and large-scale distribution of snowfall along the length of the Cascade Range. This page discusses and analyzes ENSO effects on snowfall and snowdepth throughout the entire Cascade Range from southwestern British Columbia through Washington and Oregon to northern California. A spreadsheet showing the annual snowfall recorded at Paradise Ranger Station (5400 ft / 1650 m) in Mount Rainier National Park. From the mid 1950's until 1999, this location held the world record for measured snowfall in a single season, and it was the only station in the world to have recorded snowfalls of over 1000 inches in a season. In 1998-99, Paradise once again topped 1000 inches for the first time in a quarter-century, yet its longstanding seasonal snowfall record was eclipsed by the Mount Baker Ski Area, which recorded 1140 inches (2896 cm) at its upper base area (4200 ft / 1300 m). However, Paradise still retains the world records for snowfall in a one-year period, with 1224 inches (3109 cm) falling from February 19, 1971 to February 18, 1972, and for average annual snowfall, with a mean of 717 inches (1821 cm) over the official 1971-2000 period of record and 692 inches (1758 cm) over the 50 years of consecutive data since 1954. During the previous decade, snowfall records are fairly spotty, and only a few years have enough data to compile a seasonal total. The snowfall data is of fairly good quality before that from 1919 to 1943, but the average annual snowfall recorded during this early period is much lower (less than 540 inches per year) due to a combination of several factors. First of all, a few years in this period are missing a month or two of data, causing roughly a 5% reduction in the annual average. The most important factor is the period of extended drought from the 1930s to early 1940s, along with a possible difference in early measurement techniques. In some of the early data, daily snowfall appears to be computed from the change in total snowdepth, which results in significant undercounting during periods of heavy snowfall due to settlement. Another very similar spreadsheet showing the annual snowfall recorded at Crater Lake National Park headquarters (6400 ft / 1950 m), which is located in a shallow bowl just south of the caldera rim. This location probably has the highest recorded average annual snowfall in the contiguous US outside of Washington State (although Timberline Lodge on Mount Hood might be greater, if there were more complete and accurate snowfall records for it). The 528 inch (1340 cm) average since 1931 surpasses that of any ski area in the Sierra Nevada, Wasatch, or Rockies. Note that snowfall records are largely missing for four years during World War II. Also, official records prior to 1931 are fairly spotty, with numerous months and even whole years missing entirely along with occasional missing snowfall data, which may contribute to the abnormally low snowfall totals listed during the 1920s. The Western Regional Climate Center calculates their long-term averages for Crater Lake using data since 1931 only. An interesting long-term trend made obvious by the graph is that the average annual snowfall at Crater Lake has been declining since the early 1950's. However, whatever long-term climatic factors are responsible for this decline have not affected Mount Rainier Paradise in a similar manner. Quite surprisingly, during the decade prior to 1943, Crater Lake often recorded greater snowfall than Mount Rainier Paradise during any given year. But since then, there have only been two seasons (1950-51 and 1992-93) where Crater Lake surpassed its northern counterpart (and Paradise is missing some data for 1950-51, so that season might not count). Paradise now typically receives 150-250 inches more snowfall than Crater Lake, but in some years its margin has exceeded 400-500 inches. The cause of Crater Lake's snowfall decline relative to Paradise is not obvious, since Crater Lake is 1000 ft higher in elevation and thus should be better protected from the effects of increasing global temperatures. It may be due to long-term climatic cycles in the Pacific Ocean system (such as the Pacific Decadal Oscillation) which have only recently been recognized and studied. Unfortunately, Crater Lake was too far south to have received the full bounty of several huge Northwest snow years from 1996-2002 (which helped to maintain and even boost the level of the long-term averages at places such as Mounts Baker, Rainier, and Hood), and it was also too far north to reap the full benefit of the huge 1994-95 and 1997-98 snow years in California. This is a useful tool for observing the relation between monthly snowfall and the buildup and melting of the snowpack over the course of the season. It displays combined snowfall and snowdepth data for Mount Rainier Paradise and Crater Lake National Park headquarters, starting with the 1916-17 season. These sites are of great importance because they are the only high-elevation, high-snowfall locations in the Cascade Range which have reasonably complete weather records covering the entire year over a period of several decades. A custom plotting program (using PHP and the GD graphics library) can display the data for any season or site, with user-selectable options for which data and plot elements are shown, including average, maximum, and minimum values. Whistler!?!? What does Whistler have to do with the Cascades, you might ask? Well, plenty, since Whistler Mountain is strategically located adjacent to two of the Cascade volcanoes of British Columbia, about 15 miles (24 km) north of Mount Garibaldi and 16 miles (25 km) southeast of Mount Cayley. This location has the only snowfall records at any high-elevation site among the Cascade volcanoes of BC (records are also available for Grouse Mountain at 3700 ft in North Vancouver, but that is much farther south from the volcanoes). 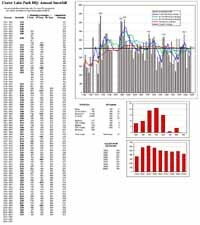 This spreadsheet shows both monthly and annual snowfall recorded at Pig Alley Weather Station (5445 ft / 1660 m) on the north side of Whistler Mountain, covering mainly the length of the ski season from November through April, plus May for the latest years and some year-round data in the 1980s. Significant snows often occur at this elevation in October and in May-June, so the true annual snowfall is nearly 450 inches (1140 cm) versus the recorded annual average of 396 inches (1010 cm) since 1972. Surprisingly, the ski area claims an even lower annual average of only 360 inches (914 cm), in marked contrast to most ski areas which take great pains to inflate and exaggerate their snowfall totals. The second spreadsheet provides a nice comparison, showing data taken in the town of Whistler at less than 2200 ft (700 m) elevation. The town is located astride the southernmost pass through the Coast Mountains, which divides the Howe Sound drainage to the south from the Lillooet River valley to the north. Annual snowfall is only 160 inches (400 cm) down here at the foot of Whistler Mountain, and snowfall is is largely limited to November-March, with very little accumulating during October or the spring. Okay, Mammoth Mountain is definitely not in the Cascade Range. However, it is an important and well-known volcano, a lava dome located on the southwestern rim of the enormous Long Valley Caldera along the eastern edge of the Sierra Nevada. Mammoth is the most commonly skied volcano in North America (and probably the world), hosting a huge ski area with over 20 lifts including a two-stage gondola to the summit. This spreadsheet shows snowfall recorded at the Main Lodge at 8900 ft (2700 m) on the north side of Mammoth Mountain since the 1968-69 season, along with the ski area's opening and closing dates each season. Mammoth boasts one of the longest ski seasons in North America, because of its elevation (the highest of any West Coast ski area) and excellent snow preservation on a mainly northern aspect. The average ski season length of over 7 months is exceeded only by Timberline Lodge and Whistler/Blackcomb on the West Coast, and perhaps matched by a couple of the highest Colorado ski areas such as Arapahoe Basin. Snowfall in the Sierra Nevada is quite variable from year-to-year and month-to-month compared to other major ranges such as the Rockies or even the Cascades, with a very high standard deviation about the mean value. It also shows a strong positive correlation to El Niño. The Sierra receives the largest recorded snowstorms in the world (see the records above), yet weeks or months or years with massive snowfall are often followed by even longer periods of sunny high pressure and drought-like conditions. The volcanoes of the California Cascades share this variability to a smaller degree, along with the El Niño correlation (see the Cascades El Niño / La Niña page for more info). The contrast between snowfall patterns at Mammoth and locations far to the north in the WA and OR Cascades or the BC Coast Mountains is striking. For example, the average annual snowfall at Mammoth is about 20% less than at Whistler Mountain, yet the standard deviation is nearly 40% larger. The maximum annual snowfall at Mammoth of 617 inches is nearly 7 times its minimum of only 90 inches, while the maximum at Whistler (667 inches) is less than 3 times its minimum (234 inches). NEW as of Feb 2005: Historical NWAC Climatological Snowdepth Data & Plots: An archive of snowdepth data at selected sites in the Olympic Mountains and Cascade Range from Mount Baker to Mount Hood (and now extended north to Whistler Mountain and south to Crater Lake and Lassen Chalet), covering the period from November 15 to May 1 starting with the 1916-17 season. This data was originally compiled by the Northwest Weather and Avalanche Center (NWAC), and I have taken the liberty of supplementing it with additional data including the Whistler, Crater Lake, and Lassen sites. A custom plotting program (using PHP and the GD graphics library) can display the data for any season or site, with user-selectable options for which data and plot elements are shown. Much Older Version: The spreadsheet at right shows snowdepth data at selected sites from Mount Baker to Mount Hood, covering the period from November 15 to May 1 starting with the 1996-97 season, as compiled by NWAC. The semimonthly frequency of this data gives a clear picture of the evolution of the snowpack's depth during the winter and early spring seasons. This is a very interesting and useful set of data, since it includes the near-record and record seasons of 1996-97 and 1998-99, along with the severe drought season of 2000-2001. Note that the values for average, minimum, and maximum are for the entire period of recorded snowdepth, which varies from less than 30 to over 70 years at these sites. This spreadsheet was updated through the 2002-2003 season. See also the Archive of NWAC Climatological Snowdepth Reports available online, covering the period from the 1997-98 season through the current season. Available in two formats: full-size 1170 x 6750 GIF (438 kB) and 5-page printable PDF (203 kB) at 50% reduction. Revision History: Original version with 14 snowdepth sites, created Dec 2002. Revised and expanded to 37 sites, Dec 2003. Further expanded to 45 sites and annotated with site info, Jan 2004. Minor revisions, Feb 2004. Revised and expanded to 48 sites, Nov 2004, then 72 sites in Dec 2004, 84 sites in Jan 2005, and 94 sites in March 2005. This is the most important figure on the entire page, the product of hundreds of hours of my research time over the past three years, compiling and analyzing data from numerous different sources. 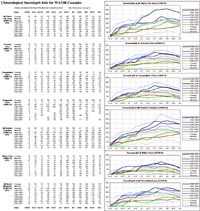 This spreadsheet shows monthly snowdepth data and plots for 92 measurement sites which are on or near the Cascade volcanoes, from British Columbia all the way south to Lassen Peak. This includes 12 sites in southwestern BC, 38 in WA, 30 in OR, and 14 in northern CA. It covers the period from January 1 to May 1 over the full length of the available historical record at each site. Basically, this chart provides the most complete overview available anywhere of the expected depth of the winter and spring snowpack on any of the Cascade volcanoes, at elevations ranging from just below timberline to far down into neighboring valleys. The majority of these sites are manual snow courses, where measurements are typically taken near the first of the month from January to May (or June farther north). See the info from California snow surveys and NRCS snow surveys to learn more about the methods used. Unfortunately, most manual snow courses managed by NRCS (including those in OR and WA) were discontinued in the 1980s, replaced by a smaller number of automated SNOTEL sites which typically provide only snow-water equivalent and not snowdepth (although they do offer the huge advantage of hourly telemetry versus monthly manual measurements). Snowdepth gauges are finally being added to many of these SNOTEL sites. Only a few of the sites in this chart, those which are measured daily at a snow stake, have snowfall data available in addition to snowdepth. In general, the sites with the greatest snowdepth in each region or near each volcano have been included here. The average yearly maximum snowdepth at these mid-high elevation sites typically occurs near April 1, varying up to a few weeks earlier in the southern part of the range and a few weeks later in the northern part. The average April 1 snowdepths shown here range from about 200 inches (5 m) at several sites in Washington to barely 60 inches (1.5 m) in parts of the southern Oregon Cascades. The low snowdepths in southern Oregon are due to a combination of decreasing elevation of the Cascade Range and rain shadowing from the increasingly higher Coast Range and Klamath Mountains. In the northern California Cascades, snowdepths again increase at sites with roughly the same elevations as those in southern Oregon. For convenience, the sites are classified according to their average April 1 snowdepth and their degree of year-to-year variability, see the bottom of the chart for a key to the classification codes. A few notable sites at lower elevations (with correspondingly much lower snowdepths) have also been included for comparison with their higher neighbors in the same area. Largest Snowdepths: The largest average snowdepths recorded anywhere in the Cascade Range are at Jasper Pass in the North Cascades east of Mount Baker and at Cayuse Pass east of Mount Rainier (this site is actually closer to Chinook Pass), with April 1 averages of 198 and 197 inches respectively over their period of record. The historical monthly snowdepth data are fairly complete at both of these sites, but unfortunately measurements no longer occur on a regular basis at either site. Also of note is the site at Blue Lake, halfway between Mount Saint Helens and Mount Adams, which would appear to be the snowdepth champion with an April 1 average of 201 inches. However, this is an artifact of a limited data set during decades of plentiful snowfall (1959-1978), and the Jasper and Cayuse sites have April 1 averages of 218 and 207 inches respectively over the same time period, so Blue Lake is really third. Interestingly, all three of these sites are located 12-20 miles (20-30 km) due east of a major Cascade volcano, so it is natural to speculate about what would cause the three greatest snowdepth sites to occupy such similar locations, other than mere coincidence. One possibility is that the precipitation and snowfall at these sites may be enhanced by a convergence zone effect, as the mean westerly flow splits around the volcanoes and converges several miles to the east. This is only my own speculation, and it is really a shame that data is not available for Blue Lake after 1978, since a significant decline in relative snowdepths at Blue Lake after the May 1980 decapitation of Mount Saint Helens would have provided strong support for this theory in a way that can normally never be obtained. Another surprising result revealed in this data is that the largest average April 1 snowdepth recorded on any of the Cascade volcanoes is not on either Mount Baker or Rainier, but on Lassen Peak in California! In fact the average snowdepths at the Mount Baker Ski Area, Mount Rainier Paradise, and Lassen Peak Lake Helen sites are statistically equivalent, with Lassen holding a slight edge in the April 1 annual maximum over similar periods of record (178 inches at Lassen versus 175 for Baker and Rainier, with records from 1930 at Lassen and 1926 at the other two sites). Although the Lassen site is at a much higher absolute elevation than the sites on Baker or Rainier, all three sites are quite similar relative to timberline, being located in open meadows about 1000 ft below timberline. In addition, the California snow surveys use a more robust measurement technique (a snow course) than that used at the Baker or Rainier sites (a single snow stake), so the validity of the Lassen figures is quite certain. But obviously, if there were any (sheltered, wind-protected) measurement sites at 7000-8000 ft (2100-2400 m) on Baker or Rainier, the average snowdepths at these locations would far surpass Lassen's amounts. Lassen vs. Shasta: The numbers also show that Lassen Peak gets about 50% more snow than Mount Shasta near the 8000 ft (2400 m) elevation. Both of these sites (Horse Camp and Lake Helen) are in open meadows on the southwest sides of their respective peaks, so this is a very fair comparison. How does Lassen receive so much more snowfall, given that Shasta is not only farther north, but is much taller and thus should induce more orographic lifting and precipitation? Unfortunately, Shasta is located in the rain shadow of the Klamath Mountains, which reach over 9000 ft (2750 m) and are directly to the west and southwest, right in the main storm track. These mountains intercept much of the precipitation, except for a southerly flow which can move directly up the Central Valley towards Shasta. In contrast, Lassen has no such obstructions, rising 10000 ft (3000 m) above the eastern edge of the Valley and fully exposed to all of the typical storm tracks. Although no snowfall records exist for Lake Helen on Lassen Peak, the 178 inch average snowdepth on April 1 contains an average snow-water content of 79 inches. Since new snowfall has a typical water content of about 10%, the inescapable conclusion is that Lassen Peak must receive an average annual snowfall of well over 600 (possibly 700) inches per year near the 8000 ft (2400 m) elevation, while Mount Shasta probably averages about 450-500 inches at the same elevation. Lassen Peak is thus the snowiest place in California, far exceeding Shasta and also any location in the Sierra Nevada. (See the section below for further info on this). Volcano Rain Shadows: Another interesting revelation can now be found in this set of data, following its recent expansion to include many more data sites. That is, surprisingly, the rain shadows of the major isolated Cascade stratovolcanoes don't all extend in the same direction. The common belief is that Pacific Northwest rain shadows extend to the east and northeast of the blocking mountains, since the primary moist flows come from the west and southwest. 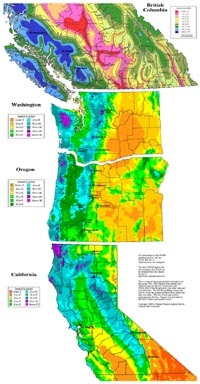 For example, well-known precip data from lowland sites shows a strong rain shadow extending NE from the Olympic Mountains centered on the town of Sequim, and the high crest of the Cascade Range as a whole throughout WA and OR casts a strong rain shadow onto locations east of the crest in central WA and central OR (see the precip map below). But the volcanoes have some interesting quirks. Only a few of the volcanoes actually have snowdepth and precip measurement sites on enough sides to determine the rain shadow direction, including Mount Baker, Rainier, Saint Helens, and Hood. On all of them, in general, the favored south and southwest slopes receive the most abundant precipitation and snowfall. On Baker, the rain shadow clearly extends to the north and maybe even the northwest (very strange), while the northeast and east sides receive huge snowfalls. See this data culled from the main spreadsheet, which shows snowdepths at six sites on Mount Baker along with a map of their locations around the volcano. On Rainier, the rain shadow extends strongly northeast, especially towards Crystal Mountain, while locations to the east near Chinook Pass have tremendous enhanced snowfall. There are no useful data sites to the north of Rainier, so it's unclear whether that direction is rain shadowed or not. On Saint Helens, the pattern appears to be similar to Baker, with a strong rain shadow to the north but very high snowfall to the northeast and east. On Mount Hood, the rain shadow extends to the northeast towards Cloud Cap and east towards High Prairie, while locations to the north like Red Hill have big snowfalls and similar precip to the south side and thus no rain shadowing. Farther south, there are fewer truly isolated stratovolcanoes and also fewer useful data sites located on or near them. Mount Jefferson's rain shadow appears to extend eastwards, but information about the north and northeast is minimal. The Three Sisters have a strong eastward rain shadow towards Three Creek Lake, but the presence of three volcanoes clustered in a north-south line with the neighboring Broken Top just to the southeast complicates any analysis of the situation. Diamond Peak appears to have a strong rain shadow which extends east, and perhaps also somewhat northeast. On Mount McLoughlin, its rain shadow doesn't appear to extend east or northeast, but there are no data sites to check the north side. Also, the entire volcano in this case is somewhat rain shadowed by the Siskiyou Mountains to the southwest. As mentioned earlier, Mount Shasta also suffers somewhat from being in the rain shadow of the Klamath Mountains. Shasta has only a very few data sites in useful directions, but one of them shows that the east side towards Brewer Creek does not appear to be strongly rain shadowed. However, an amazing thing about Shasta is that during the spring, one can easily observe the effects of its rain shadow on the mountain itself and the numerous medium-sized volcanoes to its north and east while climbing high on the mountain. Ash Creek Butte to the east retains a deep snowpack, while the slightly taller Whaleback to the northeast is usually barren of snow, as are the shorter volcanoes extending north in a line. Shasta's rain shadow extends to the northeast and north. Anyway, this all seems quite revealing and very interesting to me, and it's certainly useful for planning spring ski trips. Just because the south side of a volcano shows 100" of snow remaining at a measurement site, once can't expect to find a comparable snowpack on routes on the rain shadowed side. However, I don't have a good explanation as to why the volcanoes differ so much in their rain shadow directions. Similar isolated stratovolcanoes in seemingly comparable locations clearly have very different precipitation distribution patterns. The effects of regional topography on the direction of incoming moist storm flows must contribute significantly to the rain shadow direction. For example, this is certainly the key factor affecting Mount Shasta's snowfall as mentioned above, and also its rain shadow. Precip map available in two resolutions: reduced 750 x 1440 (283 kB GIF) and full-size 1250 x 2400 (559 kB GIF). Snowfall map available in one resolution: full-size 600 x 1020 (195 kB GIF). The first map shows the average annual precipitation throughout southern British Columbia, Washington, Oregon, and northern California, covering the entire length of the Cascade Range and beyond. It is actually composited from 4 separate original source maps, so the colors and legends differ somewhat between the various sections. The precip map for BC was scanned from the out-of-print Atlas of British Columbia (University of British Columbia Press, 1979), while those for the three US states come from the Spatial Climate Analysis Service (SCAS) at Oregon State University. The US maps have a much higher spatial resolution and accuracy due to the use of the PRISM system for modeling precipitation in mountainous terrain. Throughout the region covered by this map, the great majority of precipitation falls during the winter season (November-May). At higher elevations, above roughly 3000 ft in the north ranging to 7000 ft in the south, most of this winter precip falls as vast quantities of snow. The locations of numerous Cascade volcanoes, along with a few other important peaks, have been marked on the map for easy reference. These maps paint a vivid picture of the dominance of orographic (mountain-induced) effects on precipitation patterns in the Pacific Northwest. Most obviously, the strong rain shadow of the Coast Mountains, Olympics, Cascades, and Sierra Nevada is clearly evident. As one crosses the crest of these ranges from west to east, the precip falls off by roughly a factor of 10 over a distance of only a few dozen miles/km. 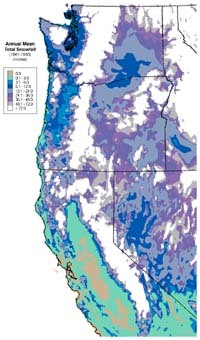 The areas of greatest precipitation are centered on the highest parts of the various coastal ranges and also on the high volcanic cones of the Cascade Range. A marked north-south trend is also evident, as maximum precip decreases from well over 140 inches in BC, WA, and northwest OR down to only 60 inches along the crest of the High Sierra at the southern edge of the map (despite the 12000-14000 ft height of this crest). Several other interesting localized effects can be seen on the map. Of particular note is that according to the PRISM model, the maximum precipitation anywhere in the Cascade Range appears to be the 140-180+ inches occurring near Glacier Peak, which surprisingly exceeds that shown on Mounts Baker and Rainier (both noted for their world-record snowfalls). Precip in this region is enhanced by a convergence zone effect as the westerly flow splits to go around the massif of the Olympic Mountains and then converges on the downwind side near Stevens Pass and Glacier Peak. If Glacier Peak really does receive more precip than Baker or Rainier, then it almost certainly would get more snowfall at comparable elevations too, but unfortunately there are no snowdepth or precip sites located on Glacier Peak (the nearest is at Miners Ridge, 8 miles to the NE and not a very high snowfall/precip location). However, as far as I know, the greatest average annual precipitation actually recorded at any site in the Cascades is an astonishing 170 inches per year (since 1983) at the June Lake SNOTEL site at 3300 ft on Mount Saint Helens. This exceeds any measuring station on Baker or Rainier or anywhere in the North Cascades, and for comparison even the Hoh Ranger Station in the famed Olympic rain forest averages "only" 134 inches per year. Although not an official record, I believe that June Lake has the highest average precipitation of any measurement site in the contiguous US, and its maximum of 232.7 inches in 1996 easily exceeds the official contiguous US record of 204.04 inches, also set in 1996 at Laurel Mountain, OR. Looking south to Oregon and California, the driest areas of the main Cascade Range can be found from Mount McLoughlin to just north of Mount Shasta (as discussed in the snowdepth section above), where average precip reaches only 30-60 inches. The cause is clearly due to rain shadowing by the Klamath Mountains located to their southwest, which receive 3-4 times as much precip as this portion of the Cascades despite their somewhat lower summit elevations. But the driest of all the Cascade volcanoes is the broad shield of Newberry Volcano in central Oregon, located about 30 miles (50 km) east of the Cascade Crest and thus in its rain shadow, receiving a paltry 20-30 inches. Surprisingly, the very similar shield of Medicine Lake Volcano in CA, which is located roughly the same distance east of the main Cascades arc, receives nearly twice as much precip as Newberry with 40-50 inches at its higher elevations. Apparently, this relative bounty is due to the lack of a well-defined high crest in this part of the Cascade Range, allowing more precip to flow through to the east side (note the high-precip belt just south of Shasta, which occurs over the low foothills in the Shasta Lake area). The precipitation disparity between Shasta and Lassen discussed above can also be clearly seen on the map, as Shasta receives only 60-80 inches while Lassen gets 80-120+ inches. In fact Lassen receives more precip than any location in the Cascades south of the Three Sisters region in Oregon. The second map at right shows annual snowfall throughout the same region, except for British Columbia. This map is from the Climate Atlas of the United States 2.0, and unfortunately it is of limited usefulness in mountainous regions of the western US. Although the map was generated using the high-resolution PRISM modeling system, the choice of displayed contours shows detail only for low-elevation, low-snowfall areas, while high-elevation areas simply appear all-white as "over 72 inches". A better choice of contour intervals such as 100, 200, 300, 400, and 500 inches would provide much more useful information about annual snowfall in the Cascades and Sierra. In addition to this major shortcoming, the snowfall map available on the Climate Atlas CD-ROM is also of limited spatial resolution, so it appears quite grainy. I'm still searching for a better snowfall map. Whistler Blackcomb Ski Resort, Mount Baker Ski Area, Stevens Pass Ski Area, and Mount Bachelor Ski Resort. Thanks to Fred Richardson for providing updated info about record snowfall amounts.